Meets Air Force Association Victoria, 24-36 Camberwell Road, Hawthorn East. Meeting dates to be advised. Did You Attend our Armistice Commemoration on 4 Nov? Thank you to those members and guests who attended our Centenary of the Armistice Commemoration event on 4th November. You can now view individual and group photos that were taken at the event here. Ordering details are also included. 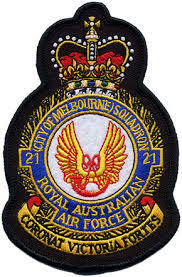 Originally formed on 20 April 1936 at Laverton in Victoria, as a reserve unit of the Citizen Air Force, 21 Squadron flew wartime patrols escorting troopships across the Great Australian Bight enroute to Europe. After re-equipping with Wirraways, the unit moved to Singapore Island in August 1940. On arrival its aircraft were gradually replaced with Brewster Buffalo fighters and the unit then moved to north-east Malaya. The Japanese invasion one week later resulted in two aircraft being destroyed and five damaged on the ground. The remaining serviceable aircraft flew to Butterworth and withdrew first to Ipoh and then to Kuala Lumpur.